The Unedited 206 | Travel Musings • Yummy Insights • Join me on my tasty journey! I was approached by Sony late last month to be one of 2 Seattle participants in their The Unedited 206 project. Similar projects are happening in major metropolitan cities throughout the U.S. Did I mention I WAS APPROACHED BY SONY? It’s true! Once I got past the, “Whoa – Sony wants to see what I shoot” part, and agreed to their long contract and conditions, I moved on to feeling as if the world was sitting on my shoulders. Imagine how difficult it would be to shoot 50 photos (no deleting or editing) that depict “the 206” in your own eyes! I’m known as being the go-to girl for all things Seattle, but I didn’t want to include a steam of 50 typical Seattle scenes. 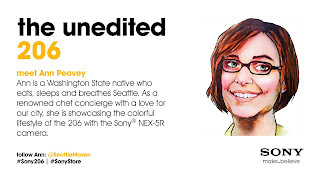 The Pike Place Market, Washington State Ferries and Space Needle are fantastic – don’t get me wrong – but I wanted my viewers (and Sony’s) to understand the various threads that make up this truly dynamic city that I love. So I approached the project from an atypical standpoint: Behind the scenes. Tiny snippets of what make the city tick from my point of view. But to do it in 10 days? That’d be a challenge! Diving into the project, I had a general idea of things I’d shoot, but no idea how I’d be able to get the perfect perspective on the first shot every time. While I’ve taken photos that I’ve loved in the past, I’ve also taken dozens of shots of one thing just to find the one perfect photo. The framework of the project allowed me only once chance – and I’d have to make it work! 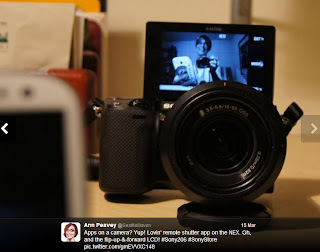 The folks at the Sony store were great when I arrived to pick up my new NEX 5r. One of the girls at the store gave me a few ideas, and showed me some shots of the city she’d taken as inspiration and wished me luck. I headed out the door with camera in hand, and a bzillion ideas swirling through my head. Mostly what I’ve learned from this is that Sony has some amazing cameras (and that I should never judge a book by its cover and that I can’t wait to get out and take more shots of Seattle. Likely in the future, I’ll try to make more albums of my photos with a distinctly clear theme. It’s fun just imagining the possibilities! Disclaimer: As mentioned above, I did sign a hefty contract with Sony. The images from the project are theirs to keep (but I’ve been given permission to share a few, too). Now that the project’s over, I’ll keep the camera and its fabulous accessories (including a sweet telephone lens, too).